Whether old or young everyone will have unlimited access to your fun party photo booth and can take as many photos as they want. Take a selfie or go in with five others. Don’t forget to grab some props from the large selection we provide. Then strike a pose and collect your instantly printed high quality photo. 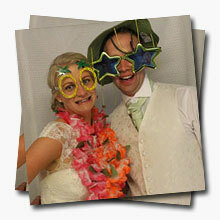 Just imagine the fun a photo booth could bring to your wedding! With no limit to the amount of photos your guests can take everyone can have instant high quality photos to take home with them. They make great wedding favours while capturing all the fun of your special day. With our guest book service you will have a copy of all the photos put together in a guest book, personalised with messages from your family and friends. This will be given to you along with a USB stick of all the digital images on the day. So you have all the memories to keep from your special day. Your photo templates are personalised with your names and the date of your wedding, and are co-ordinated with your colour scheme. Our in house design team will email you your template in advance for your approval. Ensuring your photos just the way you want them. We had a Photo Booth for our wedding and it was fantastic. The staff were brilliant and we couldn't have asked for anything better! Everybody loved it!!! We hired the Photo Booth for our wedding and it was fab. Everyone had so much fun.